Last Friday morning was Grandpa Willman's funeral. We had to be at the church pretty early, so that we could set up. Somehow I ended up being the only person with a video camera and a tripod. So I wanted to get there in time to set up. While I was setting up, Jacob and the big boys ran around, playing with their cousins. The 'boys' practiced their trumpets too. Grandpa had wanted a trumpet quintet of Taps played at his funeral. Eric's cousin, and brothers both play trumpet, as well as his Dad, and Uncle. Eric was the weirdo of the Willmans by choosing saxophone. ;) About 10 years ago, Dad made an arrangement of Taps intro to the National Anthem, and Grandpa had gotten to hear it at his 90th birthday party in 2006. But, when it came right down to it, the boys (Dad and Uncle Jon) didn't think they could go through it. I don't blame them. I have been able to sing in a group at the funerals for our grandparents, but I don't think I could blubber though playing an instrument without cracking. So, they decided to use a video of the Anthem, and then have the cousins play an intro of Jesus Christ is Risen Today, which actually sounded wonderful. I love that Willman Family funerals are full of music and Joy. It may sound weird that I say a funeral is full of joy. But by coming literally from a tragic surprise like Suzy's death and funeral had been, coming to Grandpa's, well, he was 98, he'd led a full life, and in the grand scheme of deaths and suffering, his end had been pretty quick. He'd only been in pain for a few days, they gave him morphine for the first time Monday, and he had slept a lot during the week, but felt good enough to go for a haircut on Wednesday, but then he was gone by Friday. They had some notice he wasn't doing well on Friday, so Jon and clan had gone to spend the evening with him. They said their goodbyes for the evening, and he passed away before they got home. He didn't want or need to linger, he had Better Places to be. And that's the thing, this funeral was a great celebration of where we knew Grandpa was now, back with Grandma in heaven. Grandpa was a Faith Filled man, and although not the most outspoken of his Faith, it was a part of daily like, and we knew and he knew where he was headed. Our cousin Sean is a Pastor now, and he gave the sermon for the service. Earlier in the week, in NY they used the story of Jesus raising Lazarus from the dead at Suzy's service. I thought it an odd choice to talk about all of Jesus' miracles, when here Suzy died. If we were gonna talk about Miracles, let's get Suzy back, eh?! But Sean took the same passage (it was a Sign!) and ran in a different direction, a much better direction. The bible tells us Jesus wept at the news that even Jesus was sad at the loss of his friend, just as we are sad at the loss of Grandpa. We will miss him. But we weren't made to die. Jesus had the power over the grave. He raised Lazarus. So then Lazarus got up and went to Jerusalem with Jesus, and it was a Party when they arrived, yeah, Palm Sunday. And then Jesus turned around and Raised Himself from the grave a week later. It was like, Lazarus's death was the last one that Jesus or any of us needed to worry about, because once Jesus' job was done. And we don't need to worry about Grandpa, or Suzy, because we Know where they are. They knew Jesus, and they have gone to see him. We never need worry about Death, ever again, because Jesus went before us. Now, why couldn't they have said that in NY when my sister needed to hear it. I felt so comforted by Sean's sermon. Sure, we cried. We laughed. We remembered with love how Grandpa would make us laugh. He loved his kids and grandkids, and although he was not a man of many words, you knew when he cleared his throat to speak to all of us, it was going to be important. There was always a hush when Grandpa stood to speak. He had a commanding presence, and the whole family respected him But at the same time, he was loving. I'll miss that. The children brought him Joy. He loved being around the boys; there were a couple rare occasions a few years back, I got to zip up to Marion without any kids, and well, Grandpa demanded to know where the kids were. I learned my lesson. I brought the boys. It made me smile when the kids would go tearing through a room, and he'd just smile at them. Their noise never made him upset or angry. Well, he couldn't hear it anyway. We had to Yell at him, Bang on the door when we visited, repeat everything, but mostly he was content to just be in a room with his family. He loved doing puzzles, being surrounded by them. For his birthday this year, he got 5 new big puzzles as a gift. One would think that he would have done them in his little hospital-ish room one at a time - Nope - he had one opened on the bed, one opened on the table, one on a chair... No surface was left uncovered by puzzles. I remember going to their old place, and seeing half complete puzzles on multiple tv trays, and I was so worried Chris would knock down one of those trays. Grandpa never minded though. These were the last pictures I have of Grandpa, at his 98th birthday party just before Easter. Christopher volunteered to "help" him open his presents. Grandpa had his own ways about things. He was proud of his Service, but he didn't like the Marion VA, so for the longest time, he would have Aunt Betty and the cousins drive him to Wright-Patterson Air Force Base for doctor's appointments. He insisted on it. And as Grandma pointed out long ago, you don't mess with the Colonel. He liked twinkies, and gardening, and golf, and clothes that he had worn for 30 years. It was nothing to see him in maroon pants hoisted up above his belly button, and a green shirt. And the socks...oh the socks! He wore all manner of crazy socks. All of them probably 30 years old. When we arrived at the viewing, the cousins began to ponder and discuss. What sort of socks was Grandpa wearing in that casket: green? orange? The world may never know. Right before the Service, Aunt Betty brought out some pairs of Grandpa's socks. The pall bearers were allowed to put on a pair of Grandpa's socks. The colors were awesome, the elastic practically shot on a couple. Travis's were anklets. And Karl's had a red stripe along the top, like socks my Dad used to wear in the 80s. But Grandpa would not have spent money on new ones, or asked for then, when these were still 'perfectly good'. It's a sign of the generation. And I love it. And I loved it even more when the boys put Grandpa's socks on, to honor him, and his brassy taste. It takes a rare man to rock avocado green, or orange socks in a blue or grey suit. We were debating what the verb form would be? Pallbearing? Travis declared it Bearing Pall. We had a mighty handsome crew: Eric, his brother Karl, cousins Travis, Kyle, Simon, and his brother Ryan, I know it's weird to take pictures at a funeral. But at the same time, we're all together, and how often does that happen? Our boys all clean up pretty good. My boys did pretty well too. Jacob fell asleep on Eric's shoulder (I'm pretty sure Eric has magic shoulders) during the service, and was so mellow when it was done, he even let Grandma hold him. He really is getting better at learning that lots of people love him, and it's ok to let them do so. We got a big kick out of the next generation. Now Eric's Dad is the oldest son, so that puts him as Grandpa, the patriarch, of our group anyway, though technically, there are some cousins that are older. In fact, cousin Tom's daughter Peg came over, and she said her Dad was making demands of someone or other, and she said, "He's taking his new job of Patriarch, and letting it go to his head!" But no one had the job of Patriarch down like Grandpa (Wilbur Willman). I get sad to see how the band may break up. I'm already scheming some kind of giant family reunion trip. Anyway, I got a big kick at the after funeral luncheon at the church, of seeing our generation loving on the next generation. Chris went through the line with his Grandpa. And the next thing I know, I see Dad sitting at a table surrounded by kids. Yup, the next generation Grandpa, sitting at the kid's table. Not bothered at all by the noise or the crazy, just like his pa. And really, my boys were doing a wonderful job. I actually got to talk to some Fam, because Chris and Sam were having such a great time with their own cousins. Aunt Kitty (Katie) and her niece Tula, who is only 7 months older than Jacob, and they are catching up. Tula calls Katie Kitty or KiKi. I love it. I would be known by Kitty forever if that's what my niece called me. I have been Cafry, Cafee, and Aunty Cathy and I wear those names as a badge of honor. After the luncheon, we all filed out, got in our cars and drove to the cemetary, which was some 20 minutes away in Hartford City. That's where the Willmans were from. Back in the day, they had a store, and the storefront read The Willmanns. I want to say that was Wilbur's grandfather's store, but I'm not sure, his Uncles would know. Anyway, all the clan, both Willman and Willmann are buried in Hartford City. So we went out there. His name was already on the stone next to Grandma, but the ground was slushy, they'd gotten 11 inches of rain the night before, and the cars had to drive all wonky around the cemetary to avoid floods. And apparently, the ground wasn't holding. So they put Grandpa at the top of the hill, under his own space, not necesarily where he was going to end up. They were going to try again on Saturday to get him into the ground, but the funeral home just set up their tent and chairs and stuff on top of the hill. It was actually really lovely. And no one had to fear falling in a hole while walking near the casket. 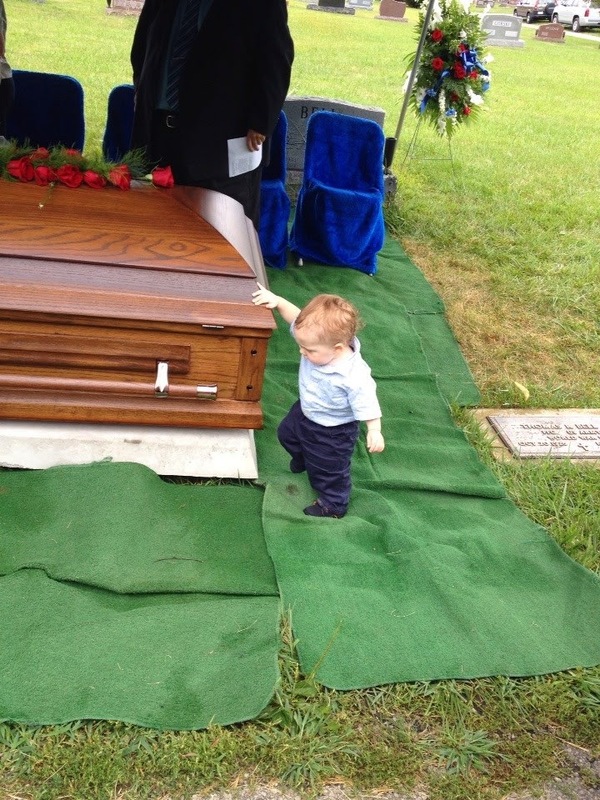 My mother in law took this picture with her phone at the end of Jacob by the casket, with the caption, Circle Of Life. Yeah. The service at the graveside was Beautiful. Since Grandpa Willman was a WWII Veteran, a Lt. Col. in the Air Force, he qualified for Burial with Honors. So the local Honor Guard came out. A Half dozen men and woman and dress blues. They beared arms, saluted, and there was a trumpeter a 100 yards away that played taps. I videotaped that too. It was funny, even though Grandpa was gone, there was something quiet and solemn and almost holy about being there, and even the kids knew it. At first Chris and Sam started to mumble about how hot it was (like 90 with 98% humidity) but when the trumpet played, all was quiet. It was neat. It made me think of what my own Grandpa, Grandpa Jim's funeral would have been like in Arlington Cemetery. I hadn't been able to make that service as we'd just had Chris and all that entailed. But this small Honor Guard shot their guns in respect of Grandpa, and they even had a tiny cannon. Pastor warned it the cannon was coming, but that didn't stop me from jumping sky high when it went off. And me, holding the video camera. Dollie Beth later said I had the Best Startle Reflex of all us. I bet. Even though they warned us, like I said, I jumped sky high. It was Loud! Bone shaking. No wonder vets ears go bad, they deal with those guns and cannons and all kinds of noise. Disconcerting. Then they folded up the flag that had lay drapped over Grandpa's casket. You know how they fold it up so it's in a tight, flag triangle. Well, then they walked over to Dad and presented it to him. That got me. I thought they'd pick the oldest person there, which would have been Dollie Beth, but no, it went to Dad. I don't know why it surprised me, it just did. There wasn't a dry eye in the house when they presented the flag to Dad, and they said something to him, I found out later it was, "On behalf of the President of the United States, and the Department of Defense, we Thank You for your Service." I still get a bit teary. 60 years after he left the Service, they are still grateful. So are we all. And I'm Thankful that they show it, especially for the family. After the service was over, and we were milling about in the hot cemetery, I suggested that our family stop in Upland at Ivanhoe's on the way to the cookout that Uncle Dean and Aunt Jan were having. It's not really on the way, a bit north to go south. But they have the longest lists of sundaes and milkshakes you ever saw. It's So Good! And you can spend all day choosing your flavor, because they have Everything. We stopped and spent about 20 minutes thinking. Sam wanted green - so mint chip it was. Chris wanted plain chocolate. It was Eric and I that had trouble. I ended up with snicker bar in chocolate. And I picked for Eric - High Noon, orange and vanilla swirled, topped with pineapple topping and a cherry. His ended up being the best one of all. Jacob loved sampling them all. He screamed at us something fierce, when we put him in his bucket while we continued to drive along and slurp our milkshakes. Maybe he is mine after all. Then Eric and Jake crashed during the drive to Noblesville. I don't blame them, I would have taken a nap too if I could have, but then there would have been no one to drive. Once we got to Uncle Dean and Aunt Jan's, I think we spent an hour in their family room just watching the babies interact. We have 6 kids under 2 someone pointed out. And Jeremiah, Jacob, James, and Cole all within 9 months of each other. They were a lot of fun to watch interact. They are just beginning to notice other kids, and want to play. The played catch. It was hard to tell who was having more fun - the kids or the grownups. Yeah, the grownups. Those kids are all So Cute! After supper, we caught Sean crashing with little Rudy. I love this. The cousins went outside to play. It was too warm for me, I was too hot and tired to hang outdoors too much, but I loved seeing them go back to their roots, and pickup some sort of game. It wasn't horsehoes, or football, in fact, I have no idea what game it was. But it made me smile to see them play, just like old times. And the next generation gets serious outdoors. I've never Seen Sam go up this high and not flip out. But he was up and down this ladder a zillion times. They didn't drink enough, and their cheeks were all red, especially Sam. On the way home, he still wasn't drinking, and he started complaining his tummy hurt. I hoped he wasn't going to puke. All this travel, and we'd been Blessed with no one puking yet. So we pulled over, and I dumped cool water on his head, neck, and down his throat. I wasn't very kind, but he cooled down quick. Then I put some peppermint on his neck, and gave him the peppermint roll-on just to smell for the rest of the way home. It worked.